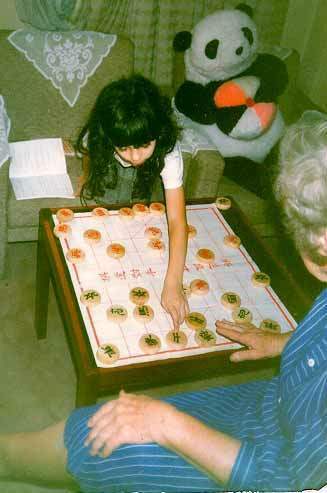 Shamema Honzagool Sloan plays Chinese chess against her grandmother in Beijing, China in 1988. 1. One of the red pieces in this position is misaligned. Which is that piece and where should it be? 2. After the position has been corrected, what were the moves leading up to this position? For more about Chinese chess, see: Chinese chess competition in Beijing in 1988 , Henry Fok awards prize to Xie Si Ming , Xie Si Ming , Xie Si Ming in Singapore , Ismail Sloan being awarded the title of "First Foreigner of Chinese Chess", in Beijing, China in 1988 and Sam Sloan, Xie Si Ming, Shamema Sloan and Helen Marjorie Sloan on the Great Wall of China in 1988 . To order "Chinese Chess for Beginners", see: To Order Books . Order "Chinese chess for Beginners" by Sam Sloan from Amazon Books. For still more about Chinese chess, see Chinese Chess Home Page. Review of the book "Chinese Chess for Beginners"